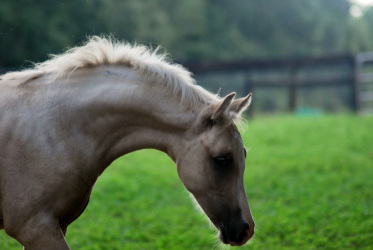 Fernview Mr Bentley - Cottage Farm Inc.
Bentley is the perfect package of a sport pony all wrapped up in a golden coat. His big personality is perfect for the show ring! We expect him to mature a s a large as his 1/2 brother and sisters have. Take your pick of disciplines he could perfom. Sire, Ollie was many time champion in breed shows and Driving events. He was also champion of his ASPR inspection. All his accomplishments can be seen by clicking on his name above. Mischka was bought by Cottage Farm specifically to produce sport ponies. She was successfully Evented through Training and shown Recognized Dressage through 2nd level. Seeking a very special home for this golden boy as he is Mishcka's (Jasmine) last foal.